The long-awaited English edition of the monograph on the Hungarian Angevin Legendary, written by Béla Zsolt Szakács, has finally been published by CEU Press in Budapest. The Hungarian Angevin Legendary is perhaps the most important illuminated manuscript connected to the Angevin rulers of Hungary. It is a painted legendary, which in its current fragmentary state presents 58 legends (including the life of Jesus Christ and the Virgin Mary) on lavishly illuminated pages. 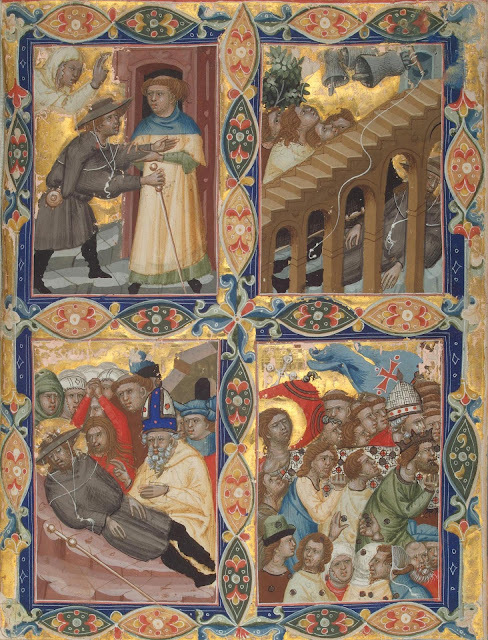 Each page contains four scenes from the lives of the saints, and the images are only accompanied by short captions. The largest part of what remained of the codex was bound together in the eighteenth century in a volume housed in the Vatican Library. Some of the missing pages, often incomplete, have found their way into collections from the United States to Russia - most of the pages being preserved at the Morgan Library. As of today, altogether 142 leaves from the Legendary (some of them fragmentary) are known in six different collections of the world. Since the digitization of the codex Vat. lat. 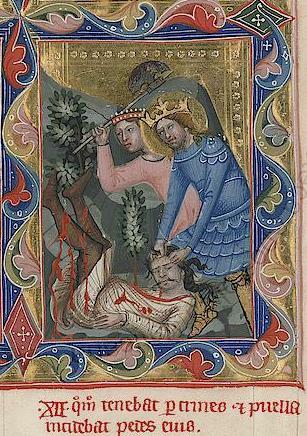 8541 by the Vatican Library, images of every page are available online (I have collected all the pictures on Pinterest). It is possible that some other fragments will come to light, as the original number of folios is estimated at 176. The quality of its execution and its sheer size indicate that the manuscript must have been a royal commission, and its iconography – rich in Hungarian and Angevin saints – suggests it was created for the court of the Hungarian Angevin kings. 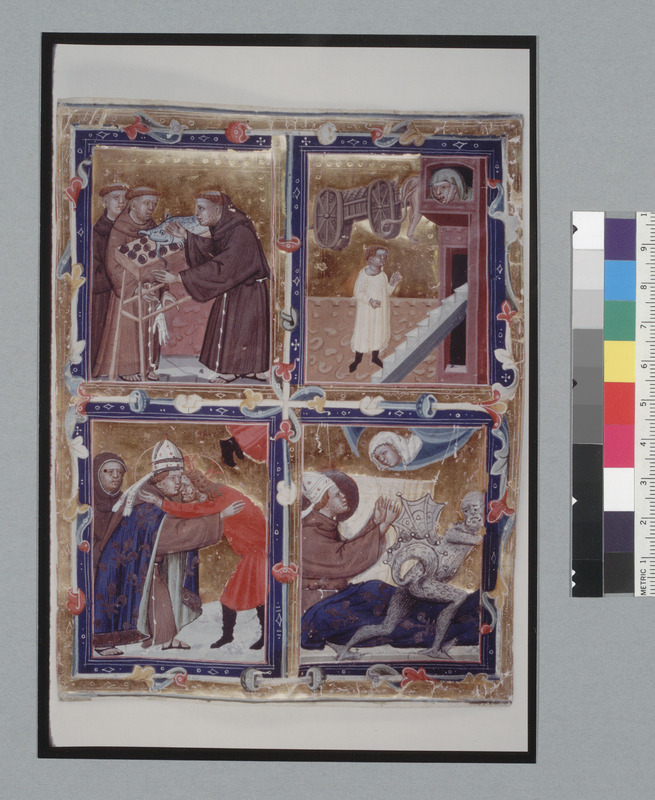 The monograph provides a detailed analysis of the image cycles contained in the dispersed manuscript: it provides a reconstruction of the original manuscript, analyses the different narrative of saints and their arrangement, and explains the significance of certain narratives. The book analyses the system of selecting and arranging the legend within the book, and also deals with the structure of the individual narrative cycles. 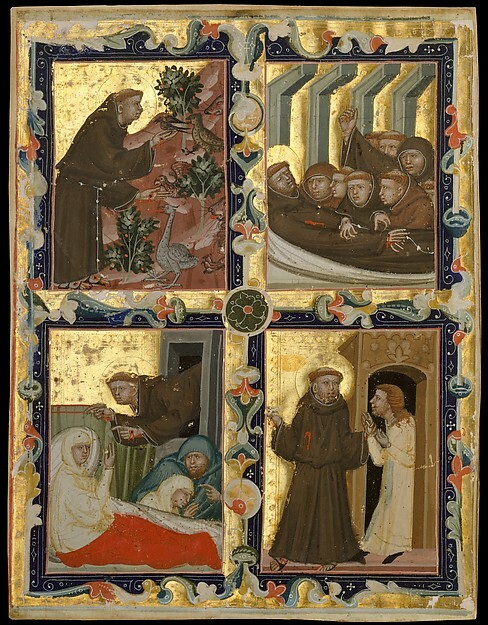 Another part focuses on image types recurring in the lives of several saints. The book was originally published in 2006 in Hungarian. The English edition has been updated, among others with additional bibliographical references, and it also contains a much higher number of illustrations than the original version. The new volume was presented by Ernő Marosi at CEU on June 23, 2016. The book is available at the publisher as well as at any good bookseller. Béla Zsolt Szakács (PhD 1998) is head of the Department of Art History at Pázmány Péter Catholic University and associate professor of the Department of Medieval Studies at CEU, also contributing to the Cultural Heritage Program. He has been active in a CEU research project focusing on the visual resources of medieval East Central Europe in the framework of which he was extensively dealing with the Hungarian Angevin Legendary. His major research fields are Christian iconography, medieval architecture in Central Europe and the history of monument protection. 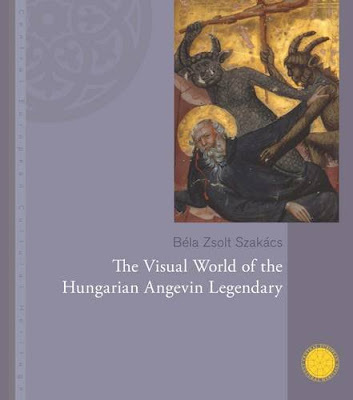 There are several international journals dedicated to medieval art, just as there are many dedicated to Hungarian art historical research. In this post I would like to call attention to two journals which may be not as widely known, but both of which contain a large number of important studies about medieval Hungary, among other topics. As such, they are both highly recommended for anyone interested in latest research in this field. Both journals celebrate important anniversaries this year, with the publication of volume 20. As this number shows, both journals started after the fall of Iron Curtain, and represent the increased scholarly connections of East-Central Europe with western scholarship in medieval studies. I will briefly introduce both journals and their anniversary issues below. 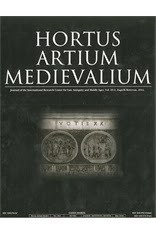 As the publisher informs us, Hortus Artium Medievalium is the annual journal of the International Research Center for Late Antiquity and Middle Ages (Motovun, Croatia), established in 1993 (IRCLAMA). The journal has a particular interest in studying artefacts for the history of art, and to study the period from Late Antiquity to the end of the Gothic period in an interdisciplinary, international and diachronic fashion. An annual colloquium gathers appropriate specialists, from which the papers are drawn. The journal is edited in Zagreb, by Miljenko Jurkovic, whose work is supported by an international editorial board and an advisory board. The high level of the publication is also ensured by Brepols Publishers. The strongest focus of the journal is on the Late Antique and Early Medieval period, as well as on the Mediterranean area, but there are also articles on other subjects. Among these there are also a large number of articles on Hungarian subjects. Articles are published in Italian, French, German and English, depending on the subject matter and the author. There are close to 100 articles in this double issue, if we count the introductory texts to each thematic units, and the studies are authored by a wide range of international scholars. There are also a number of book reviews. The journal is also made available online by Brepols, by subscripton (although some introductory texts are freely available). Here you can also browse older issues, which can also be ordered from the publisher. The Department of Medieval Studies at the Central European University is an interdisciplinary center of postgraduate education and research located in Budapest. It gathers students from all over in Europe who are interested in studying the medieval past. The volumes of the Annual of Medieval Studies at CEU offer a series of articles on various aspects of the history of medieval Central and Eastern Europe and gives an overview of the articles of the department in the academic years. The journal is a very important forum for new research by young scholars in Central Europe, while also publishing articles by leading researchers of the period. The journal is interdisciplinary, and has a very strong focus on Eastern and Central Europe. 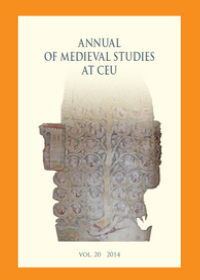 Volume 20 of the annual celebrates 20 years of Medieval Studies at CEU. Like every year, there are a number of art historical studies in the journal - this time among other things on my favourite subject, medieval wall painting in Transylvania (by Anna Kónya). Contents of new issues are generally listed on the department's website, but the journal is also freely available online, although the last five years are always password-protected. Szabolcs de Vajay, an outstanding medieval historian of Hungarian origin, passed away last year in the 90th year of his life. 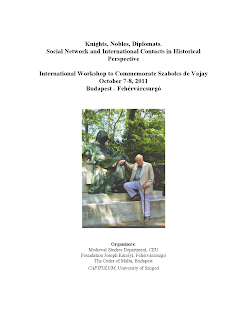 Of Hungarian origin, professor Vajay lived in Vevey, Switzerland, and wrote extensively on heraldry, genealogy, dynastic history, the knightly orders and many other questions. An international workshop to commemorate him will be held on October 7-8 at Budapest and Fehérvárcsurgó. I could not find the program of the conference anywhere on the web, so I uploaded the invitation I received here. You are advised to contact the organizers listed there if you intend to participate. Ever since the Department of Medieval Studies has been established at the Central European University (Budapest) in the early 1990s, CEU Press has been publishing a number of important books on medieval subjects. Most of these books are dedicated to the medieval history of East Central Europe. The series of Central European Medieval Texts made important primary sources from this region available in English translation. CEU Medievalia, on the other hand, is a series largely dedicated to publications by members of the Department. A couple of new books have recently been published in these two series. 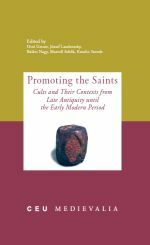 Promoting the Saints Cults and Their Contexts from Late Antiquity until the Early Modern Period. Essays in Honor of Gábor Klaniczay for His 60th Birthday. Eds. Ottó Gecser, József Laszlovszky, Balázs Nagy, Marcell Sebők, Katalin Szende (CEU Medievalia - CEU Press, 2010). For the contents, click here. 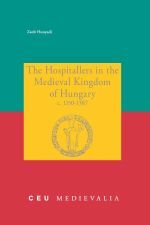 Another new volume, the 13th in the CEU Medievalia series is a monograph on a long-neglected subject: Zsolt Hunyadi: The Hospitallers in the Medieval Kingdom of Hungary, c. 1150–1387 (CEU Press, 2010). For more information, click here. The fifth volume in the Central European Medieval Texts Series has also just been published: Anonymus and Master Roger [Central European Medieval Texts Series Volume V]. Ed. János M. Bak, Martyn Rady, László Veszprémy (CEU Press, 2010). For more information on the book and the series, click here. This book, along with János Bak's collected studies (János M. Bak: Studying Medieval Rulers and Their Subjects: Central Europe and Beyond (Variorum Collected Studies Series). Ed. Balázs Nagy, Gábor Klaniczay. Ashgate, 2010) will be presented on November 10 at the Department of Medieval Studies at CEU. For an invitation and the detailed program, click here. 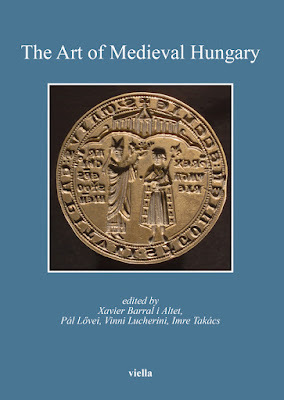 For other medieval history books published or distributed by CEU Press, see here. The CEU Medievalia series and the Central European Medieval Texts Series are both available from Amazon (click on the covers below for more information). Three interesting conferences in the next few days will focus on different aspects of Hungarian medieval history and art. 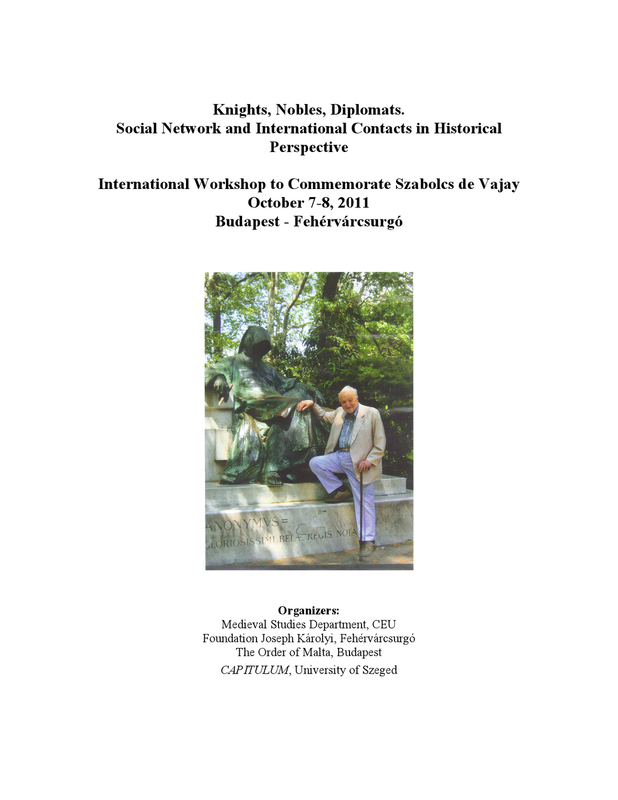 The first conference, to be held on October 16 at Székesfehérvár, focuses on King Charles Robert (1308-1342), Hungary's first king of the Neapolitan Angevin dynasty. The conference, organized by the Museum of the Bishopric of Székesfehérvár, is to commemorate the 700th anniversary of the coronation of Charles Robert. Although Charles ruled from 1308, only his third coronation in 1310 was accepted as fully legal (with the Holy Crown, by the archbishop of Esztergom and at Székesfehérvár). The conference is titled Charles Robert and Székesfehérvár, and talks will focus on aspects of his coronation, his heraldic representation, seals and coinage. Art historical topics will include Hungarian luxury manuscripts from the Angevin period, and also the Angevin royal tombs at Székesfehérvár. The following day (Oct. 17th) a workshop will begin at the Central European University, running until October 19. Organized by the Department of Medieval Studies and the King Matthias Museum of Visegrád, the workshop is titled Centers of Power and Spiritual Life in the Middle Ages and in the Early Modern Period: Mendicant Orders in the Context of Urban Development and Royal Patronage. The workshop focuses on the role of the mendicant orders in the life of Central European urban centers, and will include visits to a number of such sites in Budapest and Visegrád. A description and the full program is available at the website of the Medieval Studies department.